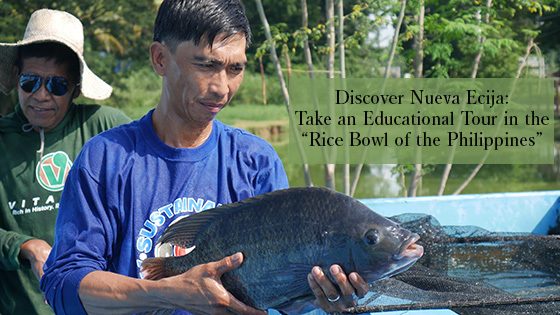 Discover Nueva Ecija: Take An Educational Tour In The "Rice Bowl Of The Philippines"
I have to be honest. Nueva Ecija would have to be one of the last few provinces in the Philippines that I would give second thoughts about visiting. I’ve already been to the “Rice Bowl of the Philippines” when I was a kid. Yet all I could remember was the unbearable heat, and the refreshing pool that my siblings and I enjoyed swimming in. But when I recently got invited to explore it, I said yes, hoping that my trip would somehow change the way I see the region again. Thankfully, the team behind Microtel Cabanatuan was able to show us a different side of Central Luzon’s biggest rice producer, as they brought us around the admirable towns of Cabanatuan, Muñoz and Palayan. If you’re heading to Nueva Ecija, visit the Science City of Muñoz, and take a quick tour around the Philippine Carabao Center. PCC, which was founded in 1993 as a byproduct of the Carabao Development Program, is an attached agency of the Department of Agriculture. What’s remarkable about PCC is that they continuosly aim towards gaining “better nutrition, higher levels of income and improved general well-being of the overwhelming sector, and the rural farming families, through the conservation, propagation and promotion of water buffalos as an important source of milk and meat, in addition to draft power and hide." During our short tour in PCC, we witnessed water buffalos being fed, bathed and prepped for milking. We were also oriented on Carabao genetic improvement, as well as briefed on the technologies being used when it comes to development and dissemination. I was never aware that a fisheries course was being offered to college students, not until I visited the Central Luzon State University. The team behind the Freshwater Aquaculture Center (a multi-disciplinary unit of CLSU), which also works closely with the College of Fisheries, briefed us on their research and development concerning aquaculture and fisheries. During our visit, we were also guided to an open, experimental facility that housed a cluster of hatcheries, where different sizes, colors and breeds of Tilapia were monitored and cultured. A Living Fish Museum can also be found just a short distance from the College of Fisheries. With an entrance fee of P5, you can already gain access to its aquariums (filled with different fish species), and its visual aids. The Hydroponics Park inside CLSU is where you’ll find plant variations that are grown using a soil-less technique. This works by planting in a mixture of nutrients dissolved in water (under controlled conditions). With the use of this technology, growing plants like vegetables can already be done almost anywhere and at any time. You’ll no longer have to worry about 'in and off-season farming'. “The Filipino people is worth dying for!” This resonated with me as I entered the Aquino-Diokno Memorial in Fort Magsaysay. The former headquarters of the 1st Military Security Detachment (1MSD), Military Security Unit (MSU) of the Philippine Army, was converted into a detention facility during Martial Law. It was where two political prisoners, Senator Benigno “Ninoy” S. Aquino Jr. and Jose “Pepe” W. Diokno, were unwillingly taken and flown from Fort Bonifacio to Fort Magsaysay, whilst handcuffed and blindfolded. They were arrested and thrown into solitary confinement shortly after Martial Law was declared. Both men also had to endure uncertainty and isolation from their loved ones, and even from each other, for four long weeks. It was a test of will and faith for these two renowned men, as they were held captive in a small and bare room, with their windows completely shut from the outside world. Now in order for them to keep their fragile bodies from deteriorating, Ninoy and Pepe would also do their exercise routines inside their rooms (sometimes outside, when allowed), which kept them active and busy. And despite being in separate rooms, they would also help uplift each other’s spirits by alternately singing Bayan Ko and Lupang Hinirang. Once inside the fort, you’ll be escorted into an Audio-Visual room that will play a short documentary on Ninoy, Pepe and about Martial Law. You’ll need to watch the video before proceeding to the actual prison cells where the two men were held in captivity. From here, you will see the wax figures of both fellows during their time in Fort Magsaysay. And if you’re lucky enough, you’ll get to meet Ms. Cely Tolentino - the cook (and Administrative Officer then) who prepared Pepe and Ninoy’s meals. There are plenty of places to see in Cabanatuan. You can look back on history by visiting the Heneral Luna Monument in Plaza Lucero, or pay homage to our war heroes at Camp Pangatian Shrine. You can also go hiking, spelunking, rafting or cliff-diving at Minalungao National Park. Gabaldon Falls and Dupinga River are also natural attractions that you can check out while you're in the area. But if you’re looking for a more relaxed activity, you can play a round of golf at Lakewood Golf & Country Club (a 10-minute drive from Microtel Cabanatuan). The Central Luzon State University has been a long established academe, that learning about it just now simply baffles me. This venue has helped develop a lot of technologies and agricultural products, and has generated a lot of innovations throughout the years. And as we dined at UMART CLSU, we were later introduced to one of its successful creations - the Tilapia Ice Cream - a novelty ice cream by Daerrys (funded by DA-BAR and DOST for its commercialization). Daerrys' delicious cold dessert is made with all-natural ingredients, using nothing but cultured Tilapia fillets, fresh cow’s milk, nuts and cheese. The taste of the Tilapia Praline Crunch was similar to Salted Caramel, given its salty bits. Surprising enough, it didn’t have any fishy smell and aftertaste. It was a gem of a product, and a great innovation that’s worth taking to the global market. For your pasalubong needs, you should try the varied treats from Milka Krem, Dairy Box and DVF Dairy Farm. You can bring home the bottled farm fresh Carabao milk from Milka Krem, the yummy pastillas from DVF Dairy Farm, and the flavored Carabao Chicharon from Dairy Box (the garlic and hot & spicy flavors are winners!). You’ll surely be craving for a cold treat, after exploring Nueva Ecija. And you'll definitely want to end the day by devouring one of the creamiest and tastiest locally-made ice creams in the province: Puno’s Ice Cream and Sherbet. Not only do these products come in varied flavors, these frozen desserts are also being offered at very affordable prices (a cup only costs P12!). Hopefully, Puno’s get to be sold nationwide, as it deserves to be recognized for its great taste and potential. Bistro 360, which is Microtel Cabanatuan’s food concessionaire, served us some of the most palatable dishes on our first night in the city. Despite being packed with guests, the serving time was still quite reasonable. I actually appreciated the cheery waiter who served our food, as he presented each of our orders with a corresponding description. He simply made a mark to us by being good at his work, which was very commendable. For dinner, we were served with Oriental Chicken Salad, Roast Beef with Mashed Potatoes, Lechon Kawali topped on Laing, and two types of Panizzas (5 Cheese and Joaquin). It didn’t take long until everything on the table was wiped out, as the dishes were that delicious. Breakfast, on the other hand, was also nice and filling. There weren’t many choices. But I still enjoyed the Giniling, Scrambled Eggs, fresh fruits and free-flowing coffee. Microtel Cabanatuan, our home in Nueva Ecija, can also take you around the area. Their very accommodating team can even take you as far as Minalungao National Park, all the way to Fort Magsaysay. Should you wish to explore these nearby sites, don't hesitate to inquire about their rates and schedules.